This is no friendly competition, and there is little loyalty among thieves in Cadwallon! 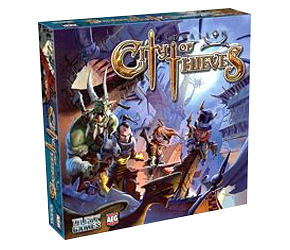 Cadwallon: City of Thieves, by Fantasy Flight Games and Dust Games, gives players control of a gang of unique vagabonds, each vying to steal the most treasure on a night of thievery and combat in the fantasy city of Cadwallon. City of Thieves is definitely a beautiful game and looks fantastic on the gaming table. The unique fantasy world of Aarklash was first created by Rackham Games (now, sadly defunct) for their miniatures skirmish game Confrontation, and some truly talented artists worked on making it a reality; big names such as Paul Bonner, Paolo Parente and Marc Simonetti. The city of Cadwallon was developed in detail for Rackham’s short-lived Cadwallon tactical roleplaying game, and several sets of excellent floor tiles were created for that game as well. While those games are no more (though I highly recommend grabbing the floor tiles on Ebay; they’re useful for all kinds of tactical games), the licence has lived on in games such as Arcana and City of Thieves. So this game comes with three pages of detailed background information on the city and the characters you play—it’s by no means a pasted-on, generic fantasy theme. One of the other stand-out features of this game is the spectacular collection of plastic miniatures—twenty in all, and all unique and incredibly detailed sculpts that are almost worth the cost of the game alone. There are four figures for each gang, plus two militiamen and two independent characters. These figures are definitely a treat for you miniature painters; they are a joy to paint and playing the game with fully painted figures really brings the game alive. However you non-painters need not despair; FFG make available two packs of pre-painted miniatures for the game, sold separately. Apart from the figures (and some clever colour-coded snap-on bases), you get a beautifully illustrated board showing the district of Cadwallon you’ll be thieving in, 20 character cards to identify your gang member stats and special abilities, 24 Chest tokens (the treasure your thieves are after), 28 clear red plastic action point tokens, 15 Mission cards, 80 plastic coins (ducats), a round counter, 9 Portcullis markers, 25 character tokens, and 6 dice! There are also 4 thick, double-sided Adventure boards, each side describing a unique game scenario. Those coins deserve a special mention; they’re some of the best game coins I’ve ever seen, come in three colours (bronze, silver and gold), make a very satisfying ‘clinking’ sound when dropped on a pile, and would be perfect to use for all kinds of games that use coins—fantasy and historical. But what about the game, I hear you ask? All that lovely production wouldn’t be much good without a fun game. If you have a problem with luck and random dice rolls in games, this won’t be your thing, but I think it strikes just the right balance between fun dice-fest and a bit of strategy and thought. The game is fast-paced, thematic, and things ramp up nicely towards the end when some hard decisions have to be made about staying in the district and grabbing more loot, or escaping to enjoy your ill-gotten gains. The game is controlled by one of the 8 Adventures. The appropriate board is placed by the main game board, keeps track of the number of turns, and describes any special rules. Sure, your gang members are out to lock-pick or bash open as many of the chests sitting in rooms around the board as possible and then get off the board with their loot; but the Adventure board introduces all kinds of interesting special rules. You might be ransacking the Treasury, battling zombies, going up against a famous assassin, or rescuing the Duke’s daughter. These scenarios introduce a lot of variety to the basic rules, and the flexibility of the game system is such that FFG has already made available online a few downloadable mini-expansions. Each turn, players get to activate their four gang members with seven action points (APs). Each thief can take one movement action and one other action per turn, and some special abilities require action points, so you have to be careful how to allocate actions. Before moving your thieves however, you can choose one militiaman of the two on the board and move him a number of spaces equal to the roll of a die (on a 6 he does not move)—and these guys definitely get about, hopefully thwarting your opponent’s plans by blocking escape routes and attacking his thieves. Each player also gets a hand of Arcana cards, which give bonuses in combat, improve movement abilities (including the occasional handy teleportation spell) and other special abilities. Mission cards are special cards that are placed on the Adventure board, three at a time, and can be purchased with action points to give ducat bonuses to gangs who have a particular type of treasure. In each room on the board is a chest token depicting a particular type of treasure, and since treasures are often worth more if your gang has several of a particular type, it’s important to think ahead and decide which treasures your gang members will be targeting. You can either lock-pick a chest by spending 1 AP rolling under or equal your character’s Mind value, or bash it open immediately by spending 2 APs. Each character can carry a maximum of three treasures. Getting the treasure is one thing—getting it out of the district is another! Some treasures give you instant ducats, but most are worthless unless your character makes it off the board before the allotted number of turns runs out. In most scenarios, the alarm is sounded two turns before the end of the game, and many exits from the board are cut off by player-placed portcullises, so there’s a frantic scramble of last minute treasure-grabbing (and fighting and stealing treasure from your opponents) and then a run for the exits in the last two turns. In our game, two characters developed a rivalry that saw them stealing treasures from each other right up until the last moment, when one finally got the goods and made it off the board. You might have to decide to leave some gang members behind if they haven’t got enough treasure, though you lose 3 ducats from your total for each. Of course, the player with the most ducats after totalling up their treasures wins! I think Cadwallon: City of Thieves is a hugely enjoyable game. It’s not a brain-burner by any stretch of the imagination, but it’s a beautifully produced, richly thematic and fun game that can be played and enjoyed by experienced gamers and newbies alike. So gather your gang members together, choose an adventure, and creep stealthily into the back allies and rooms of the city of Cadwallon—if you’re skilled, and just a bit lucky enough, you may just get out with a king’s ransom. This summary and set of reference sheets includes The King of Ashes expansion.